Abstract: Standard in vitro culture methods were used to produce mature gametocytes for the SMFA. The in vivo studies relied on an NF54 line carrying a luciferase-expressing cassette integrated in the genome. NSG mice treated with clodronate lipsome supported high-level engraftment of huRBC and can be infected by this P. falciparum luciferase reporter line, including development of mature gametocytes infectious for mosquitoes and leading to salivary gland sporozoites. This in vivo laboratory model permitted a highly sensitive transmission blocking assay to reliably quantify early oocyst development on day 22 post infection when stage V gametocytemia reached 0.07-0.18%. Mice were randomly divided into 4 groups and 60 min. before direct mosquito feed, each mouse in the antibody-treatment group received 16 mg/kg mAb in 200µl RPMI by iv injection and the blank control group received of equal volume RPMI. For the in vitro SMFA, 400 µg/ml of CelTOS mAb was added to gametocyte culture 60 min. prior to the mosquito feed. The presence of CelTOS mAb significantly inhibited oocyst development in mosquitoes in both in vivo and in vitro assays. Summary: The presence of CelTOS mAb significantly inhibited oocyst development in mosquitoes in both in vivo and in vitro assays. Importantly, the experimental results with an innovative in vivo humanized mouse model confirmed that circulating anti-CelTOS antibody effectively inhibits P. falciparum ookinete development to oocyst in mosquitoes. 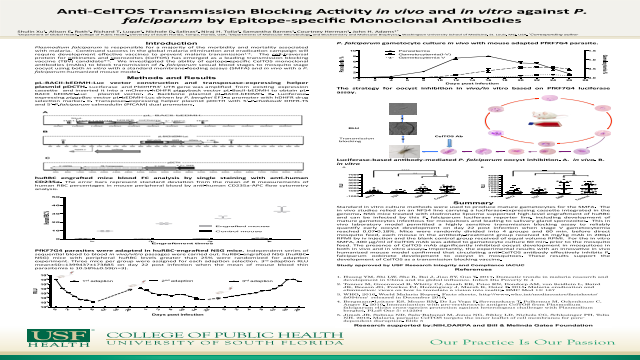 These results support the development of CelTOS as a transmission blocking vaccine. WHO. 2016. World Malaria Report. Facts sheets, http://www.who.int/mediacentre/factsheets/fs094/en/ released in December 2016.